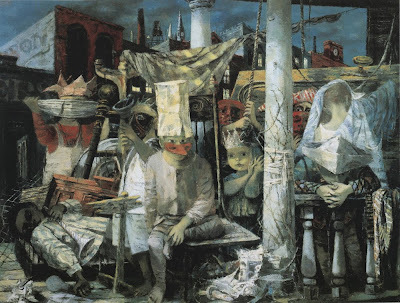 Philip Guston is of interest here because he “took an individual stand somewhere between Romantico-Surrealist and veiled Social-Realist interests” (O’Hara, F., 1975, p.134). 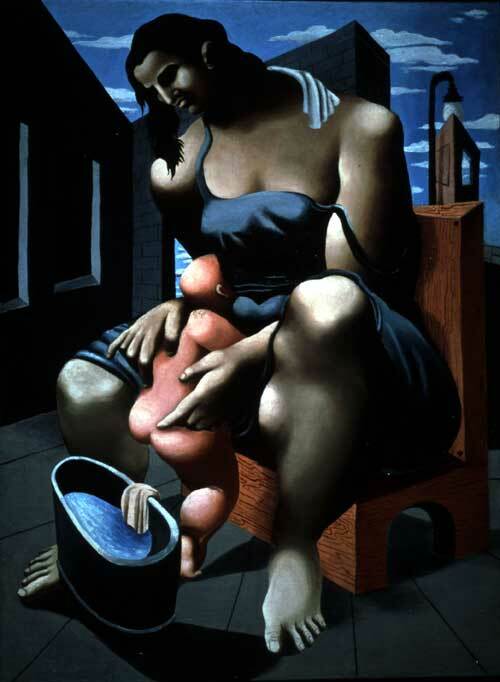 Some of Guston’s early work were “haunting reminders of Chirico” (O’Hara, F., 1975, p.134). 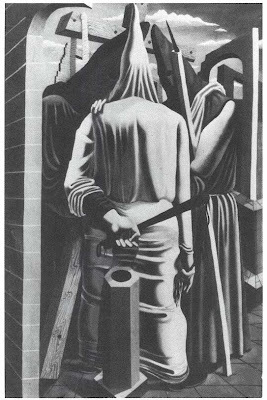 You can see in the paintings like Mother and Child from 1930 and the Conspirators from 1932. 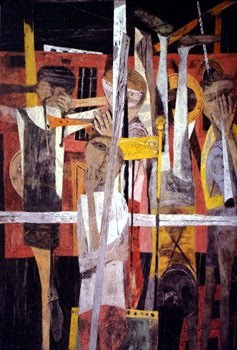 The range of influences on Guston’s work is breath taking: from Renaissance Art through to Neo-classicism and Picasso. 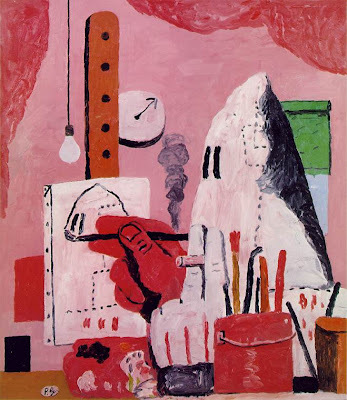 Guston seemed to move towards expressionism especially from the nineteen forties. We see the influence of Beckman. Works like If this be not I we see the compression of influences: Peiro della Franscesca and Uccello, late Cubism. Porch No 2 is more heavily stylised. The next more was going to be towards abstraction. 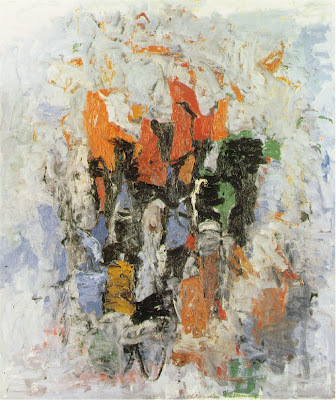 With the Tormentors we still could see the remains of “Guston’s old props” (Anfam, 1999 p. 140). Review seems filled with the “fragile, shadowed memories of an earlier vocabulary” (Anfam, 1999 p. 140). 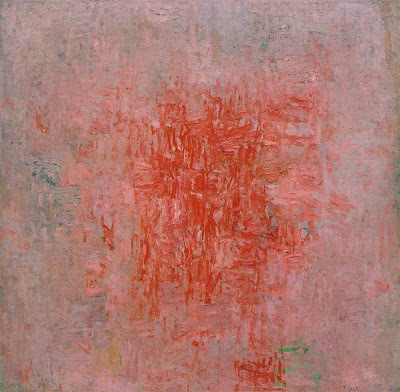 Critics largely agree that “Guston approached radical abstraction with the greatest of difficultly, only arriving there for certain, after 1951” (Wheeler, 1991 p.58). 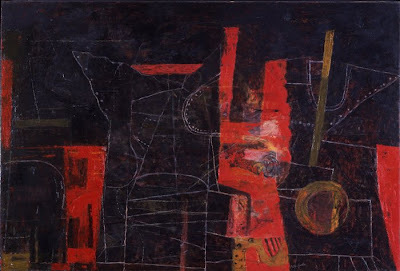 In the fifties we see Guston “resolve his divergent tendencies (Wheeler, 1991, p. 58) and “purified his paintings” (O’Hara, 1975 p. 136). The dialogues with de Chirico and Giavanni di Paola disappear – and we see the more abstract tendencies of the paintings of Cezanne and Tiepolo, Turner and Impressionism. Paintings like B.T.W and Zone are made up of shimmering painted strokes, horizontal and vertical dashes making up pluses and minuses: a Mondrian reinterpreted by Monet. The paintings of the fifties do resemble parts of Monet’s Waterlillies: The Irises 1916-23, although Frank O’Hara does say “not late Monet” (1975 p.136). This argument is also supported by Robert Hughes who sees a closer relationship between Guston's abstractions and Mondrian's seascapes he painted on the coast of Schveningen in 1912-15 (1997, p. 584). The works could be described as abstract-impressionism as all the forms are dissolved into light and atmosphere. These “optical ‘scenes’” might “be found in nature under exceptional circumstances of light, but which has nothing to do with the observation, analysis and recreation of nature’s own light-phenomena” (O’Hara, 1975 p.137). The works from the fifties into the sixties begin to show a broader range of expressions, gestures and modulations of colour. In the sixties the tones darken and the imagery seems unresolved. 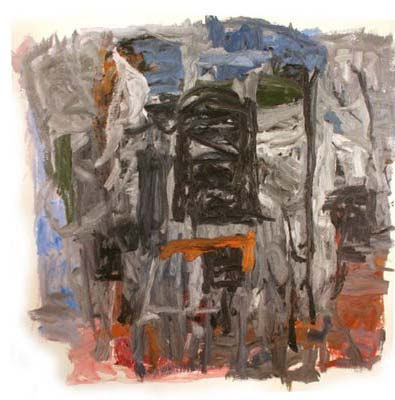 In the late sixties during a period of political and social upheaval “unexpectedly”, David Anfam recalls “he (Guston) halted the palimpsest compositions which had grown greyed and more monumental by the early 1960s and instead wretched to the surface scenes that they had seemed to cloak” (Anfam, 1999, p.207). Guston in his explanation of “his departure from high-minded formalism… said simply ‘I got sick and tired of that purity. Wanted to tell stories’” (Wheeler, 1991 p.290). 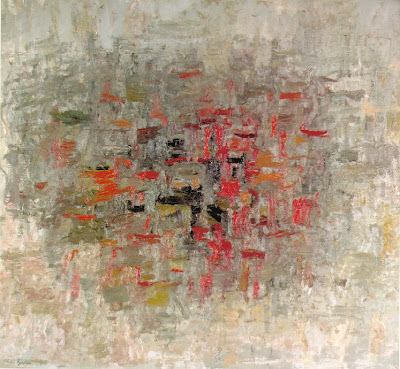 The New York Times critic Hilton Kramer called Guston “a mandarin pretending to be a stumblebum” – he was wrong. 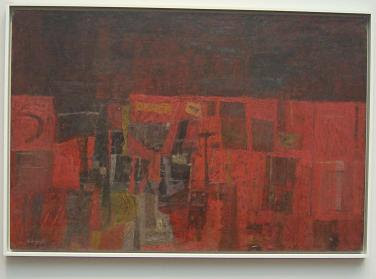 Guston brought into his paintings his earlier anti-fascist concerns, fusing it with the language of comics and cartoons. This time the Klansmen are bumbling, bullying buffoons of the Nixon years. Daniel Wheeler explains the reasons for this strategy by reminding us that “just as the Baroque had unfolded in the shadow of the High Renaissance, late modernism as a whole, as well as post-minimalism in specific, found itself struggling with the after effects of a glorious past, a modernist past whose revolutions had produced not Utopia, but instead a society shot through with grotesque incongruities, political, economic and aesthetic” (Wheeler, 1991, p.290). 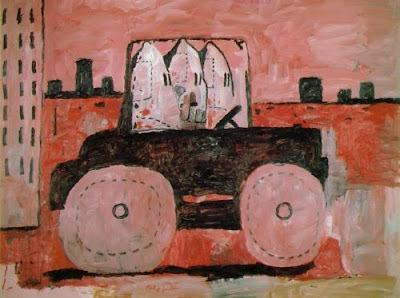 Guston’s response was to reclaim the art of his idealistic past and produce once again a humanist art. Why add Guston to this blog anyway? Well, mainly because of his struggle as an artist and the need to recognise the unresolved struggle between the idealistic, the political and a convincing aesthetic that is fully resolved and sustainable. O’Hara, F., (1975) Art Chronicles 1954-1966, New York: A Venture Book, George Braziller Inc.
Wheeler, D., (1991) Art Since Mid Century New York and London: Thames and Hudson.